What are you doing on Saturday May 11th? If nothing comes to mind, let me invite you to join us for the 1st Annual Chestermere Pet Valu Walk for Dog Guides taking place in John Peake Park. Registration begins at 10 o’clock, with the Walk beginning officially at 11 o’clock. 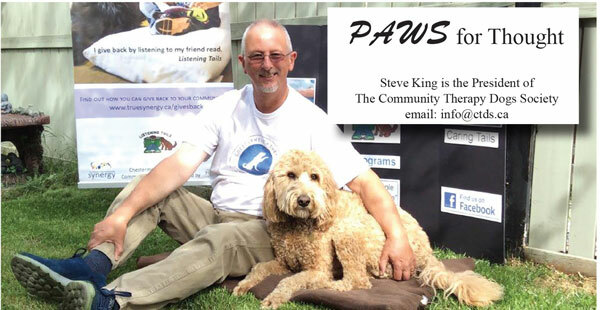 •	“Service Dog Guides”: helping Canadians who have physical or medical disabilities. •	“Autism Assistance Dog Guides”: helping families with children (ages 3-12) on the autism spectrum. •	“Hearing Dog Guides”: helping individuals (10 years +) who are deaf or hard of hearing and who are unable to detect everyday important sounds. •	“Seizure Response Dog Guides”: helping people (6 years +) with epilepsy. •	“Diabetic Alert Dog Guides”: helping people (10 years +) who have type 1 diabetes with hypoglycemic unawareness. •	“Support Dog Guides”: helping professional agencies with individuals in traumatic situations. This amazing organization, one of only 7 internationally recognized service dog organizations in Canada, places dog guides across Canada wherever there is a need. In 2018, LFOC placed 203 dog guides across Canada, of which 60 came to Western Canada. With a working life of 8-10 years, the cold reality is that the supply of dog guides will never match the ever increasing demand for their services. Each dog guide costs around $25,000 but the cost to the client receiving the dog is zero. Those of you who have dogs know how much joy they bring to your life. For those people needing Dog Guides, it is simply life changing. Over the years I have spoken to people who have Dog Guides and there is a common theme to their experiences. Those who have, for example, a Canine Vision Dog Guide describe their experience as one of regaining their independence. Having confidence in the ability of their Dog Guide to navigate them safely around the community, they no longer feel constricted and they can once again, or maybe for the first time, enjoy the outside world and all it has to offer. Those with an Autism Assistance Dog Guide describe the difference between having a Dog Guide and their pre-Dog Guide life as being like night and day. Places or events that would have been totally impractical to be at pre-Dog Guide now become possible due to the calming influence of their Dog Guide and the bonding that takes place between the child and the dog. There are many other similar stories of value being added to people’s lives by having a Dog guide. Throughout May each year towns and cities across Canada are holding a Walk for Dog Guides: this is the main fundraiser for LFOC each year. It’s worth noting that LFOC does not receive financial support from any level of government. If you would like to participate in the Walk, great! There is no charge to join us but, being a fundraiser, we would appreciate it if you could find some friends or family to sponsor you on the Walk. If you would like a sponsorship form, please email me on info@ctds.ca or you can donate on-line at www.walkfordogguides.com clicking “Find Your Walk” then “Alberta/ Chestermere” then “Support this Walk”. Look forward to seeing you on May 11th!